The last year ended up with a massive landslide blocking hydropower reservoir on Bureya River. Since the RwB reported on the issue last year considerable attention of national authorities and international media was drawn to it. Many politicians have participated in crisis-solving making this somewhat reminiscent of parallel drama of Hidroituango, where emergency operation was remotely supervised by the new president of Colombia two days ago. The only entity which keeps low profile and has minimal information on its web-sites is the Rushydro State Company which owns the Bureya Hydro. But it is known that the President of Rushydro met the President of Russia two days after Putin ordered the army to be in charge of mitigating this crisis. Large-scale emergency did not affect energy security of the region, because Bureyskaya Hydro was completed in 2010 as, primarily, export-oriented capacity triggered not by rising domestic consumption, but by hopes to sell more and more electricity to adjacent China. As we know by now those hopes were not based on realistic forecasts and the wild and scenic river was sacrificed in vain. a) What are possible causes of such massive landslide without registered seismic action and obvious deficiencies of UFO and meteorite versions? Officialdom and most independent experts with traceable reputations are adamant – this is a massive landslide, not a meteorite or rocket. Thus, Dave Petley, the Pro-Vice-Chancellor at the University of Sheffield in the United Kingdom, whose blog provides a commentary on landslide events occurring worldwide is pretty convincing: “From the imagery we can say that this is certainly a rock slope failure, and that it is highly unlikely to be associated with a meteor impact event. The slope appears to show a pre-existing tension crack or depression that aligns with the rear of the failed mass.”. Meanwhile netizens from all walks of life continue to question this hypothesis and suggest intervention of some “flying object”: UFO, meteorite, “Angara” rocket, etc. Their major reasoning is that almost 1-kilometer long and 150 meters high rock -pile is visibly far greater than relatively small 500 – meter hill from which it slid down. Besides, many point out that massive involvement of the army and announced possible relocation of two settlements may indicate unusual “secret” nature of this emergency. So far the RwB has no reason to doubt landslide hypothesis, but we want to see official report promised for release next week by Khabarovsk Province government which sent a scientific expedition that explored the site for a week and returned yesterday. b) Is there any possible relation between landslide and artificial change in Bureiskaya reservoir water levels or any other aspect of hydropower reservoir functioning? High incidence of hydropower reservoirs triggering massive bank erosion and landslides all over the world is well documented.Causes are many from simple water erosion to reservoir-induced seismicity. In Russia major erosion problems are known from Angara river hydropower cascade in Siberia. In China Yangtze River hydropower-induced landslides necessitate huge additional spending to offset effects of reservoir building. So by default connection between Bureya Reservoir functioning and development of conditions which led to the rock failure is highly likely. As we know now the site of the landslide, despite being 100 kilometers from the dam of Bureyskaya Hydro, experiences regular significant change in water level ranging from 237,6 above see level meters on May 25, 2018 to 253 meters ASL on December 12, 2018 (difference more than 15 meters). The landslide on Bureya occurred during the period of intensive reservoir level drawdown (5-12 centimeters a day), that is the usual phase in which other reservoirs are known to trigger landslides. 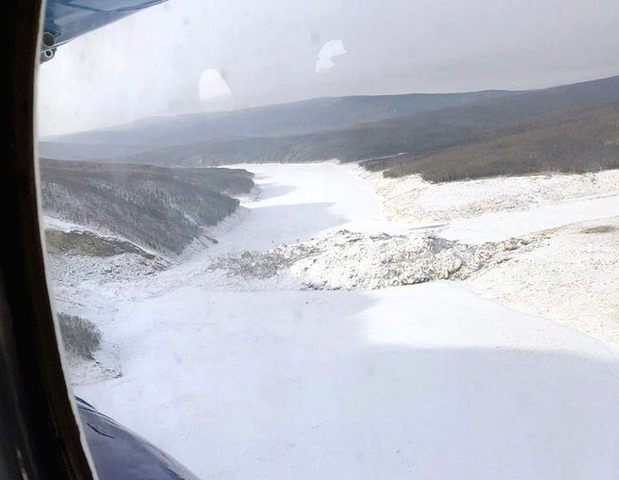 So, the drawdown of reservoir may well be a major factor in that case, and there is certainly a need for the owners of the dam to monitor the site carefully for other land-slide prone slopes. According to early reports from Dr.Aleksey Makhinov, leading geomorphologist in the region, who visited the spot on December 26, the failed slope’s toes were regularly flooded in recent past. Other experts suggested it could be exacerbated by ice-cover formation on December 9-14 and by water freezing in the cracks. Leading hydrologist of Khabarovsk Province Dr.Vladimir Kim is quoted by local media on January 15 saying: “that rock is fractured. Water got into these cracks which was facilitated by water erosion greatly increasing after the new Bureya reservoir raised water levels”. Finally, local people who posted many videos on Youtube immediately after discovery, suggest that hydropower operations could be more likely reason than UFO or rocket. But one would argue that locals are biased – hydropower forever spoiled their majestic river. c) What are likely consequences for livelihoods of local citizens, functioning of 10 cubic kilometer reservoir operation and hydropower output? 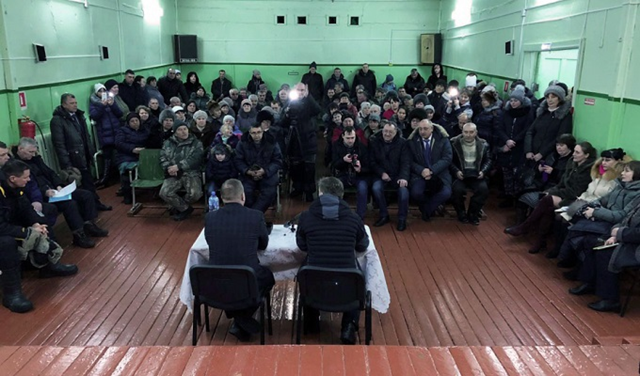 On January 17 a newly elected governor of the Khabarovsk Province Frugal came back from field visit to the scene of action and announced that he will explore feasibility to resettle permanently 120 residents of Chekunda village located 70 kilometers upstream of landslide. Arrangements for possible temporary evacuation of residents in case of emergency were made a week earlier.The resettlement proposal is explained by a possibility that water rising behind new dam may flood cemetery and some houses of Chekunda in April-May. All in all this statement looks rather strange given that on-going emergency is being actively mitigated and that in many parts of Siberia people live in much more hazard-prone conditions and authorities do not interfere. As for possible impact on hydropower generation, it was announced by the Bureiskaya Hydro that despite the loss of 28% of live volume the reservoir still holds 5 cubic kilometers of water suitable for energy generation. At the end of December the Commission for Zeya-Bureya Reservoirs Management recommended to decrease water release through the dam from 820 to 600 cubic meters per second, and then on January 9 the Bureiskaya Hydro requested the Amur Basin Water Authority to decrease it further to 550 cubic meters per second, which shows that some new circumstances emerged. It may be connected with the decision to use army to create channels in the pile of debris. No shortage of power is likely to occur since the Far Eastern Electricity System (managed largely by Rushydro) has 40% generation capacity in excess what may be needed in the hour of highest demand. 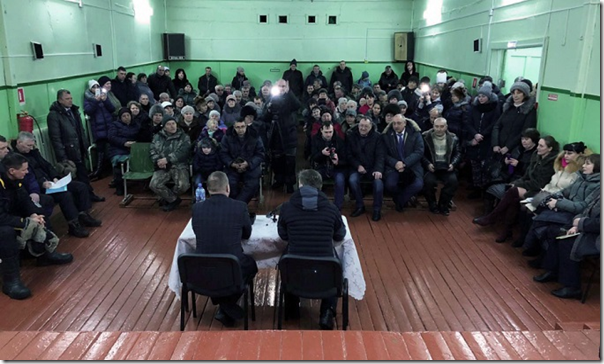 Last development on Bureya is the declaration of the state of emergency made today by Bureysky District authorities (located in Amurskaya Province), whose jurisdiction extends from the new ad-hock dam to the man-made dam of Bureysky Hydro 100 kilometers downstream. Official excuse is a necessity to “keep fishermen and vehicles off the unstable ice”, but in this respect situation is likely no more dangerous than in previous years. Likely real reason for emergency is unknown consequences of massive blasts planned for next week. d) What is possible cost of river channel restoration to the extent it is necessary to ensure safe hydrological conditions and functioning of hydropower? No reliable estimates have been made, but it is almost irrelevant, since in early January President Putin made a decision how to use this crisis strategically to put his engineering troops capabilities at test. So the Ministry of Defense of Russia is reporting on progress(in English!!! ): “The rock blockage on the Bureya River is planned to be eliminated by blasting. For this purpose, the logistics specialists will deliver more than 300 tons of explosives to the Khabarovsk Krai by railway military transport. 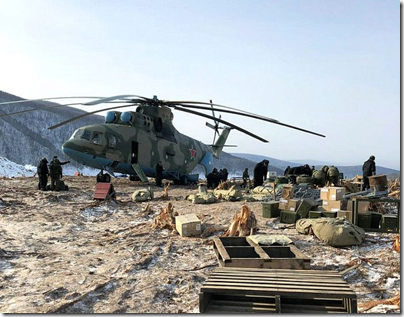 The explosives will be delivered to the place of rock mass collapse in the area of the Bureysky reservoir by combat service support units (CSS) and military helicopters. Such operations make it possible to raise the level of combat training of CSS units and to practise the most difficult issues in organizing logistics in remote areas, ”Lieutenant General Vladimir Trishunkin, chief of staff of the Armed Forces logistics staff, said. A separate engineer brigade of Eastern Military District will be involved in blasting operations in the area. Military engineers will prepare pits for the production of explosions in two channels of the Bureya River. Military engineers having arrived at the site are about to prepare over 1,000 pits by cumulative charges. More than 1,600 of these products have already been delivered in the area of work. Cumulative charges are intended for penetration of armor and reinforced concrete strata of various structures, destruction of the hard surface of roads and airfields, underground pipelines, with fortification equipment of positions and troops deployment areas in frozen soils and rocks. The preparatory work will be followed by explosions to remover the block, (which, according to press reports, will start around January 22 and likely continue until the end of February)”. Scientists also said that they see no plausible alternative to massive blasting if the dam has to be removed. As water is slowly raising upstream of the rock-slide dam and rapidly descending downstream of it, with this height difference approaching 5 meters by now, the sooner the channel is formed the smaller is the probability of catastrophic wave formation, when liberated Bureya River finally pours through. However, devil is in detail and we never know how well activities of the army, that strives ”to raise the level of combat training of combat service support units and to practice the most difficult issues in organizing logistics in remote areas ” are coordinated with multiple civilian counterparts, each having its own agenda and opinion. Soon we will witness how well they work together.